Baaheautiful bake for all ages, a real winner with the kids! 1. Preheat the oven to 200ºC/gas mark 6 and line the tin with the cake cases. 2. Put all the ingredients except for the milk in the processor and then blitz till smooth. Pulse while adding milk, to make for a soft, dropping consistency, down the funnel. Alternatively put all ingredients into a large mixing bowl and use an electric hand mixer. ​3. Spoon into the cases equally. Put in the oven and bake for 15-20 minutes until the cup cakes are cooked and golden on top, check to see if the cupcakes are ready by inserting a cocktail stick into one of the cupcakes. If it comes out dry then the cupcakes are done. As soon as possible, take the cupcakes in their cases out of the tin and let cool, on a wire rack. 1. For buttercream icing mix butter with the icing sugar and vanilla essence. Continue to mix until smooth adding the milk to loosen the buttercream. 2. Split the buttercream into 2 bowls and using food colouring, colour one pink. ​3. Spread buttercream using a palette knife on top of the cupcakes, creating a dome and smooth gently with the palette knife. Don’t worry too much as most of the buttercream will be covered with marshmallows! You will have 6 pink and 6 white cupcakes. ​1. Take some pink and white mini marshmallows and cut in half across the middle. Gently push them into the matching buttercream, starting at the outside edge of the cupcake. 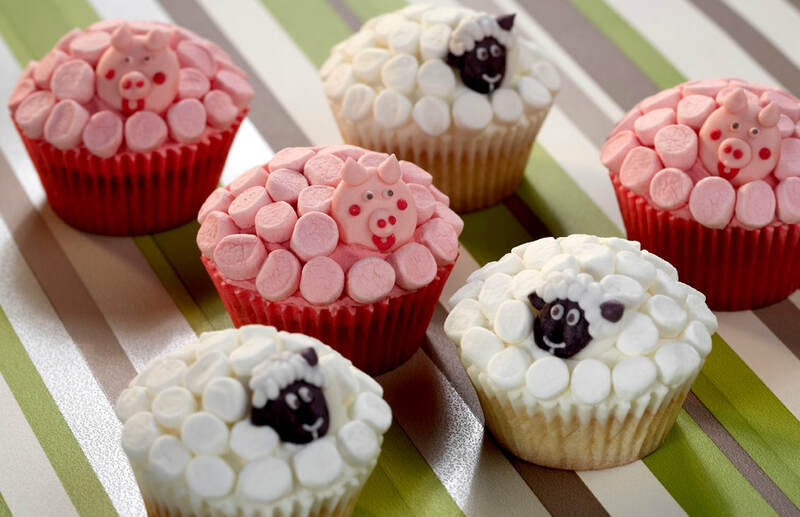 Put a sheep face on each of the white cupcakes, and a pig face on each of the pink cupcakes.